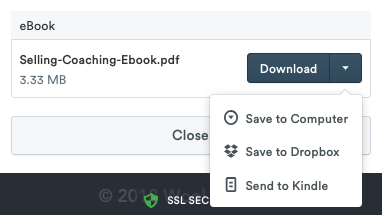 If your customer has purchased a .mobi or PDF file to read on their Kindle and they are reaching out to you, send them this support article or feel free to add the steps to your product description. 50MB is the maximum size allowed to send to Kindle. If your file is larger, we suggest splitting it into smaller files or optimizing the file to compress images, etc. To find your Send-to-Kindle e-mail address, visit the Manage Your Devices page at Manage Your Kindle. You can also find the address on your Kindle under Settings > Device Options > Personalize your Kindle. In your Amazon account, go to Manage Your Content and Devices. From Settings, go to Personal Document Settings and add noreply@selz.com under Approved Personal Document E-mail List. Click on 'Get your Downloads' on the download page after payment, or from your email purchase receipt. Click the 'Send To Kindle' button and pop in your Send-to-Kindle email address. Go to Amazon.com, log in and go to Manage Your Devices. Now open your email account and create a new email. Attach your .mobi or PDF file and send the email to your Send to Kindle address. Do not include a subject line or message. On your Kindle, press the Menu button, and then select Sync & Check for Items. Download and install Send to Kindle for your desktop. Download your purchase from your Selz email receipt or post-payment download page. Drag and drop your purchase onto the Send to Kindle application. For other options, see Amazon's Send To Kindle page.